On August 4th and 5th, I will be riding my bicycle 192 miles from Sturbridge to Provincetown as I participate in the Pan-Mass Challenge. The PMC is a bike-a-thon that raises money for adult and pediatric cancer care and research at Dana-Farber Cancer Institute through the Jimmy Fund. This is my fifth year riding for the PMC, and my second year as a member of Team Kermit. I am extremely fortunate to ride with this amazing group of riders, and I am honored to contribute to the over 3 million dollars that this one team has raised since 2005. I rode my first PMC in memory of my grandmother, Mimi, who passed away in 1988 from glioblastoma multiforme, which is an aggressive brain cancer. The entire PMC experience was one of the most meaningful adventures of my life, and I knew that my participation would continue for years to come. The following summer, as I prepared for my second ride, the significance of the Pan-Mass was unexpectedly raised. I not only rode in my grandmother’s memory, but I rode in honor of my father George, who had just been diagnosed with Non-Hodgkin's Lymphoma, and was enduring a summer of chemotherapy treatments. Since then, I rode in memory of my grandmother, in honor of my father, and in appreciation of the terrific doctors who cared for my dad during those months of treatment. This year, I also ride in honor of other friends who are battling this disease today. Team Kermit reconnects me with my high school mentor, Steven Branfman. 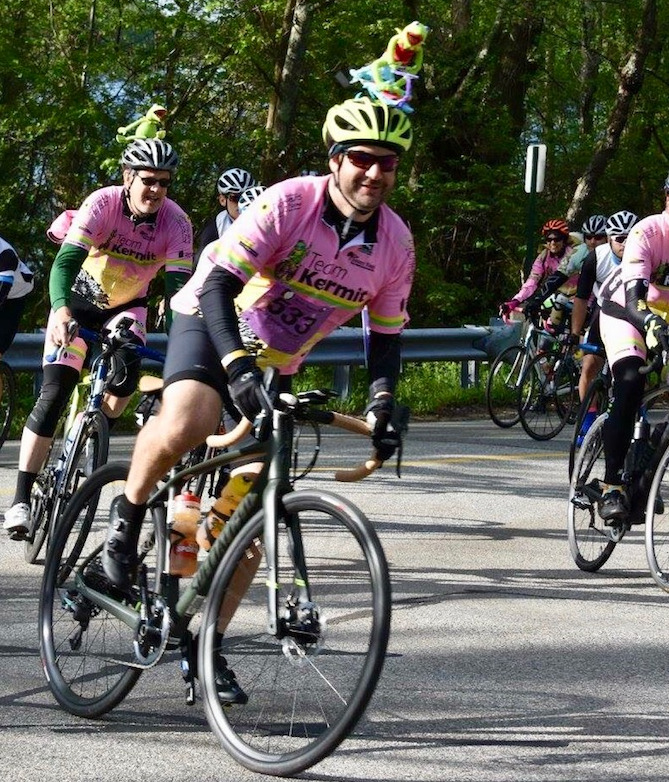 Steven started Team Kermit in 2005 with his family while his son Jared was undergoing treatment at the Jimmy Fund. “Mr. Branfman” inspired me over 25 years ago as my advisor at Thayer Academy. He has inspired me even more now with his dedication to ending cancer. Steven and his family took something as horrible as losing Jared and turned their energy to doing everything in their power to make sure other families do not have to go through what they did. The name of the team comes from one of Jared’s favorite childhood characters. As Steven says, Kermit “represents the ability that people have to rise above the ordinary in order to achieve great results.” Jared passed away after a 2 ½ year battle with cancer at the age of 23 in September 2005. We ride for Jared and everyone else who has been touched by cancer. Best of luck this year David!